To further promote the industrial production and expand the applications of magnesium alloys in the field of lightweight structural materials, the researches of low-cost, rare-earth-free magnesium alloys have received extensive attention. Mg–Sn–Al alloys possess great potentials in the application. However, their mechanical properties are relatively poor, which is incapable of meeting the requirements of structural materials for replacing rare-earth magnesium alloy. In this paper, the microstructure of Mg–6Sn–1Al–xCu (x = 0.5, 1, 2) (wt%) alloys were characterized by XRD and SEM. The mechanical properties of the alloys were investigated by combined tensile and compression tests. 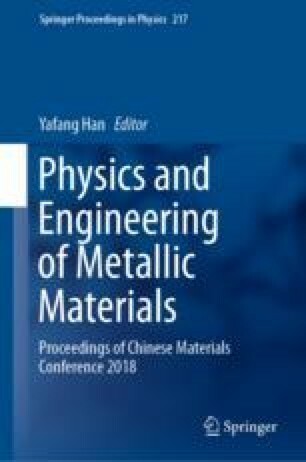 The results showed that the addition of Cu in Mg–6Sn–1Al alloys had a positive effect on mechanical properties, which was mainly attributed to the fine-grained strengthening and second-phase strengthening. In addition, comparing with as-cast alloys, extrusion processing had led to significant changes in the microstructure of the alloy. Due to the recrystallization behaviors during the hot extrusion process, the eutectic structure of Mg2Sn (Al, Cu) disappeared and transformed into granular precipitates dispersing on the grain boundary. From the tensile and compressive test, it was found that the extruded Mg–6Sn–1Al–0.5Cu alloy exhibited the highest ultimate tensile strength (UTS) of 300.1 MPa, which was 131% higher than that of the cast alloy. With the increase of Cu addition, the 0.2% compressive yield strength increased from 72 MPa of Mg–6Sn–1Al–0.5Cu alloy to 110 MPa of Mg–6Sn–1Al–2Cu alloy, but their ultimate compressive strength (UCS) remained stable. The financial support for this work is provided by the National Natural Science Foundation of China (Nos. 51571102) and the Shandong Provincial Natural Science Foundation, China (ZR2018LE001).